These days, all sorts of sprouts are popular, but I still love bean sprouts the best. 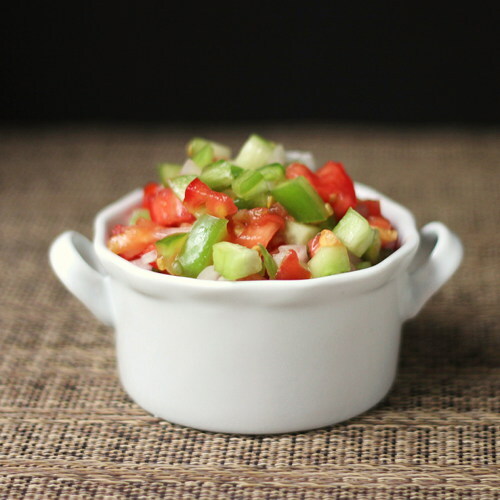 They're hearty enough to stand up to cooking without disappearing completely, and they're crisp and crunchy in salad. You can grow your own or buy them. And then what do you do with them? Second is a simple side dish, but first is a main dish that wouldn't be the same without bean sprouts - egg foo yung. This egg foo yung is an all-vegetable version (and all fresh vegetables), but you could add shrimp, pork, beef - whatever you like. While the patties are fine right out of the pan, I like them best with gravy. It also makes cooking and serving a little easier. As the patties are cooked, they go into the lightly simmering sauce which flavors them and keeps them warm for serving. Of course, I serve egg foo yung with rice. One of the main flavors in the sauce is soy sauce, which of course is salty. So it's a really good idea to use a low-sodium or no-sodium broth. That way, if you want to add more soy flavor, you won't end up creating a salt lick. To compensate for the fact that the sauce is a bit salty, I held back on the salt in the egg foo yung itself. The patties need a little salt or they'll be a little too bland, but you don't want to get carried away. These also reheat well. Just warm them gently in the sauce. First, make the sauce. You can leave it simmering lightly while you make the egg foo yung patties. Add all the ingredients to a saucepan and whisk well to break up the cornstarch. Heat to a boil, stirring as needed. Because of the cornstarch, this will thicken a bit, but it won't be crazy thick. Lower to a simmer while you make the egg foo yung. In a medium bowl, combine the bean sprouts, scallions, bok choy, celery, and mushrooms. Sprinkle on the salt, then the flour. Stir to coat the vegetables with the flour. Crack the eggs into a small bowl, add the sesame oil, and beat lightly to break up the eggs. Add the egg to the vegetables and stir to combine. Heat a tablespoon of vegetable oil in a frying pan. Scoop up about a half cup of the vegetable mixture and add it to the pan. Flatten it a bit. Add as many more scoops as will fit comfortably in the pan. Cook until the patties are browned on one side, then flip them over and cook until browned on the other side. When the patties are browned on both sides, slide them into the sauce and let them simmer there as you continue making more patties until all the mix is used up. Serve over rice and pass extra sauce at the table. Here's a side dish where the bean sprouts are prominent. They're added at the very end of cooking so they stay a little bit crisp. Heat the oil in a large pan. Add the mushrooms and bok choy and cook, stirring as needed, until the liquid is released from the mushrooms and evaporates again. Add the yellow squash and green onions and cook for a minute or so, until the squash softens just a little. Add the soy sauce and black pepper and stir. Add the bean sprouts and stir just until it's mixed well, then take it off the heat and serve. For more information on Whole Foods and Whole Foods Friday, take a peek at the tab at the top. When I was a kid, I didn't realize bean sprouts existed in any other form except canned. Mom used them in what she called "chop suey" but that was the only time they were ever used. They seemed exotic, in a canned-exotic sort of way. Years later, when I found out how easy it was to grow bean sprouts at home, I was stunned. Bean sprouts weren't an exotic ingredient that had to be imported from exotic lands. They could be grown at home with no special ingredients or equipment. It tales a little time, so you have to plan ahead. But it's not that long. I like to grow my sprouts in a quart jar. I use a canning jar, but you could use any clean jar about that size. piece of cheesecloth over the top fastened with a rubber band is all you for a lid. Put about 2 tablespoons of mung bean seeds in a quart jar - if it's a canning jar, that's enough to cover the bottom of the jar in a single layer. Pour some water in the jar, swish it around, and pour out the extra water. You want the seeds wet, but not swimming in water. Cover the jar with a piece of cheesecloth and fasten it with a rubber band. Put the jar in a dark place - in a cabinet will do. A dark corner of your kitchen is fine, but the darker the better. After one day, the beans will have swelled a bit and you'll see a few little sprouts showing. Rinse the beans again and dump out the water as before. The idea is to give the beans enough moisture to encourage them to start growing, but you don't want them sitting in a puddle of water. On the next day, there will be more sprouts. Again rinse and dump out the excess water. You'll be doing this every day. If you live in a really dry area, you can leave a little more water in the jar. If you live in an extremely humid area, you can leave the beans more dry. Here are the bean sprouts on the next day. Yours might grow a little slower or faster. That's okay. Rinse and drain again. Some of the green seed covers may have separated from the seeds, and they might float to the top of the jar if you fill it with water. You can scoop them off and get rid of them. One more day, and this is what they look like. Now you can see some thick sprouts and most of the green seed covers are detached. The jar is getting more full as the sprouts grow. Again, rinse and drain. You can get rid of whatever green seed bits if it's convenient. One more day later, and this is what we've got. The sprouts are longer and you can see some yellowish leaves. This is when they're ready. Now's the time to get rid of the rest of those green seed covers that are all loose. Also, when you buy bean sprouts, the roots are always removed. If the roots are small and thin it's probably no big deal, but if you've got big branchy roots, you might was well trim them off. You can grow these in much larger quantities, of course. Once they're done growing and you've removed the roots, you can store them in the refrigerator. They're sort of delicate - they won't stay fresh for more than a couple days. For the whole scoop on Whole Foods Friday, see the tab at the top. You don't see a lot of citrus ice creams, probably because citrus can curdle milk so easily. The secret is to use sweetened condensed milk instead of fresh milk or cream. The condensed milk thickens when the acidic citrus is added, but it doesn't curdle unpleasantly. This recipe also includes a little bit of fresh milk, but it's added at the end to thin out the mixture, and there's no risk of curdling at that point. For this ice cream, I used Italian Volcano juices. I received samples of their juices including the blood orange, lemon, and lime as well as lemonaid and limeade. I have to admit that the limeade was astonshingly good. I decided that I wanted to try cooking with at least one of the juices, and the color of the blood orange really appealed to me. I considered using it for a glaze on chicken or pork, but then I changed my mind and made ice cream instead. I still have some blood orange juice left, but I have a feeling that won't last long enough to cook with. Because cocktails happen, too. Combine the sweetened condensed milk blood orange juice, and lemon juice in a nonreactive bowl. Whisk until combined. It will thicken a bit. Add the vanilla extract, salt, and milk. Whisk until thoroughly combined. Refrigerate until completely chilled. 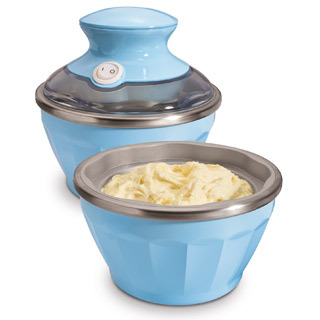 Churn the mixture in your ice cream maker according to the manufacturer's instructions. Transfer to a storage container and freeze until firm. Disclaimer: I received the juices at no charge. I was not required to say nice things or write a post. It's that time of the year - the pepper roasters are fired up and charring the skin on peppers. You'll find them at the farmer's market and at some farm stands in the area where you can buy bags of peppers ready to take home and clean. The scent of fire-roasted peppers is so enticing to me. I used to hate cleaning them until I came up with a couple tricks to make the process less cough-inducing. I used to peel the skins off under running water, but that just made things worse. Now, I have a big bowl of water at hand to rinse the peppers as I clean the skins off and get rid of the seeds. I also wear gloves. Even if you think the peppers won't burn your skin, the oils that remain on your hands can cause problems later if you rub your eyes. It's particularly annoying if you wear contact lenses. Once the pepper are cleaned, you've got a lot of options for using them. But before you find a use for all of them, grab just one pepper for this salsa. The heat level of your salsa is dependent on how hot your fire roasted pepper is. Chop the fire-roasted pepper finely and put it in a medium bowl. Dice the tomatoes and add them the bowl. Peel the cucumber, dice it, and add it to the bowl. Core and seed the bell pepper, dice it, and add it to the bowl. Add the salt, pepper, and lime juice. Stir to combine, and serve. This salsa can be made ahead of time and refrigerated until needed. Sugar & Salt: A Year at Home and at Sea is an interesting cookbook. 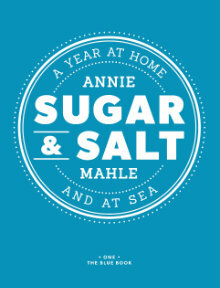 Author Annie Mahle, spends half of her year at sea and half at her own home. At sea, she cooks for crowds, while her at-home cooking is for family and friends. Must be an interesting way to live and to cook. The book is divided by month, based on what recipes Mahle might be cooking at that time. You'd think I'd pick an August recipe, or at least a summer/early fall one, right? But no, I decided to make a recipe that was at the front of the book. In January. Yep, January. But really, it's perfect for this time of year, too. Sure it's soup, and you usually think of soup as being a winter dish, but right now fresh cauliflower and jalapenos are abundant at the farmer's market. And despite the cheese, this is actually a fairly light dish. There's lots of cauliflower in there. If the idea of jalapenos in a soup scares you a little, don't worry about it. If you remove the seeds and ribs from the pepper, the heat isn't all that much. I've had soups with more heat from generous use of black pepper. Of course, if you want a spicier soup, you could leave the seeds and ribs in, or you could use more pepper, or you could choose a hotter pepper. But really, I think this wag good just like it was - with a mild spiciness and just enough cheese to let you know it was there. Heat a medium stockpot over medium-high heat. Add the oil, then the onion, jalapeno, salt, and pepper. Saute until the onions are translucent. Add the garlic and cauliflower and saute another 10 minutes, or until the cauliflower is tender. Add the flour and stir until it is completely incorporated, then add the broth and stir until the flour is dissolved. Bring to a simmer and cook for 20 minutes. Remove from the heat, add the milk and cheddar cheese, and stir until the cheese is fully melted. Do not bring to a boil (or close to it) after the cheese is added, or you risk "breaking" the soup. Reheat any leftovers gently to avoid breaking the soup. So, did I tease you enough about this book? Want more? Some more of my Virtual Potluck friends also made recipes from this book, and you can see the whole list over at Shelby's site, Diabetic Foodie. Would you like to WIN your very own copy of Sugar & Salt? I've got one to give away! For the first and mandatory entry, leave a comment here telling me what your favorite soup is. Or your favorite cheese. Or your favorite vegetable. If you don't like soup, cheese or vegetables ... uh ... meat? Fruit? Just leave a comment. It's all random, anyway. For a second entry, tweet a link to this contest and come back here and comment, telling me that you tweeted. For a third entry, pin one of the photos from this post to Pinterest. Come back here and tell me that you pinned. And that's it. 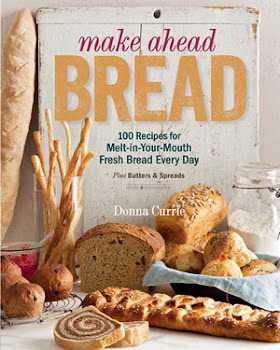 Three possible ways to enter, one cookbook for you to win. Usual contest rules apply. Contest runs from the millisecond this posts until Midnight, Mountain time on Friday, August 31. Disclaimer: I received a copy of this cookbook at no cost. The winner will receive a book directly from the author/publisher. I have adored you since I first met you. you were so ... a-peeling ... in the store, so I brought you home with me. I have been faithful. But you .... You like to play games. When I need you, you disappear. Are you cavorting with the scoops? Are you spooning with the spatulas? Why do you hide from me when I need you most? Where are you? WHERE??? I am tired of these games. I am giving you one last chance. Yes, you now have a twin. Or to be exact, a clone. Even identical twins are not exactly the same. Your new clone is a little taller, more robust. Some might even say more handsome. If you refuse to behave; if you continue to be coy and hide and pretend you don't care about me as much as I care about you, I will have no choice but to cast you aside for your newer clone. You will have to live with the spoons and spatulas and take cold comfort in the fact that I might agree to bring you out into daylight when your replacement is is the dishwasher. What do you say to that? No, I have not gone completely mad. This is an entry into an OXO-sponsored contest. I really do love my OXO peeler, though. It's possible the dish did run away with the spoon. I have no inside information on that situation, however. I later realized that the contest required entry on Facebook, but this amused me enough to publish here. Because I'm weird like that. Did this post amuse you? You can vote for it on OXO's Facebook page. When I got a review copy of the cookbook Hot & Cheesy by Clifford A Wright, I paged through all the options, gave some serious thought to pizza, calzones, frittatas, and a whole lot of delightful sandwiches, but in the end it was the mac and cheese recipe that I decided needed to be made. Yes, I was in the mood for comfort food. There are probably tens of thousands of recipes for mac and cheese, starting with a box with powdered cheese and ending with something superbly complicated. This one is on the simple end of the spectrum, but it dirties a few dishes. But once it's in the oven, you've got time to tidy up a little and make a salad, and then you've got ten minutes of resting time to get the table set and gather everyone around. This makes a LOT of mac and cheese, but I don't mind leftovers. I usually add a little milk or water to thin the sauce a bit while it heats up. Bring a large pot of salted water to a boil and add the pasta. Let it cook until it's about half-done - tougher than al dente. When it's done, drain it and keep it standing by. Meanwhile, melt the butter in a saucepan over medium heat, then add the onion and garlic. Cook, stirring, until translucent. Add the flour and cook, stirring, for about a minute. Turn the heat off and add the milk, whisking as you go, until it is all smoothly combined. Turn the heat on again and simmer the milk, stirring as needed, until the mixture is smooth and a little bit thicker, but still very liquid - about 15 minutes. Add the cheese by the hand full, stirring until all the cheese is added and it is melted into a smooth sauce. Add the mustard and salt and stir until well blended. Pour the cheese sauce over the waiting pasta and stir until combined. Transfer it to a buttered 10-inch oven-safe casserole that's at least 3 inches deep. Sprinkle the bread crumbs over the top. Bake at 350 degrees until the crumbs are golden and the sauce is bubbly - about 25 minutes. Remove it from the oven and let it rest for at least 10 minutes before serving. You might know that I'm the Gadgets columnist over at Serious Eats. It's a heck of a lot of fun, and I get to try all sorts of fun gadgets and small appliances. And now, I'm republishing some of my recent columns here, so you won't miss anything. These are all related to ... cold things. Want a little ice cream (maker)? I love home made ice cream. As soon as the weather gets warm, I start making it, and the freezer stays stocked until soup weather arrives. So I was interested in seeing how well the little half-pint ice cream maker from Hamilton Beach ($24.99) would work. You can actually make a little more than a half-pint, but not much - about 12 ounces is the maximum. While the machine is billed as a soft-serve ice cream maker, there's no reason you couldn't make the ice cream ahead of time and stash it in the freezer to harden it. The idea is to make a quick batch of ice cream - it took about 9 minutes to churn most of the recipes I tried - and then just dive in with a spoon. If you've got the ice cream mixture ready ahead of time, that's just enough time to clear the table of the dinner dishes and be waiting with that spoon in hand. I was surprised how well this little machine worked, considering it runs on two AA batteries, but that's plenty of power to get the job done as long as you've got a good recipe in the bowl. Try something that's too water-heavy and it freezes a little too fast - but that's true even with a full-size ice cream machine. The batteries are supposed to last long enough to make 25 batches of ice cream. The freezer bowl has a non-stick interior, so you're cautioned not to use metal implements in it, and it all requires hand washing, but it's not much of a chore. Like any ice cream maker with a freezer bowl. you need to give it time to freeze, but I always suggest storing the bowl in the freezer for those ice cream emergencies. While this machine isn't going to make enough ice cream in one batch for your next party, it would be kind of fun to have a few of these to use at parties, so you can let guests customize their own creations. The model I tested came with a single bowl, but there are models that include two freezer bowls, so you can make a second batch right away. For such a simple product, I had a heck of a time testing the Ice Huggy ($6,99/2). This product is designed to hold ice pops - you know, the sweet frozen treats that come in a long plastic tube. At first, I thought it was designed to insulate the ice pop to keep it from melting from the heat of your hand. I wasn't sure how much of a problem that could be, but that's what testing is all about. First, I tried to find a volunteer mom who would be willing to test the Ice Huggy with her kids. I thought that would be easy, but either the kids were too old or too young for ice pops, or the moms made their own frozen treats. Hmmm ... not quite as big a market as I expected. So I went looking for ice pops that I didn't have to buy in a big box and finally found them at a little local store that carries items the big chain stores don't. That mission accomplished, I immediately understood the real problem. Those things are cold! Just carrying them to the register, my delicate ladylike hands were getting a serious chill. The Ice Huggy acts as an insulator, but it's not protecting the ice pop, it's protecting hands from the chill. That makes more sense. Kids aren't going to want to hold something that's super-cold for very long. The Ice Huggy is made from a soft, thick, squishy material that no doubt is a good insulator. The ice pop slips into the Ice Huggy sleeve that stretches a bit to hold the ice pop snugly. There's a flap that secures with Velco so you can fold the Huggy down as the ice pop gets shorter as you eat it. It's a really good concept. Unfortunately, the ice pops I bought were fatter than the Ice Huggy was designed to hold. It was like trying to put a toddler's sock on an adult foot. Maybe there are regional or brand differences in ice pops and the ones I picked up were mutant super-large versions. It wouldn't make sense for these folks to make a product that doesn't fit the major brands of ice pops, so I have to assume that these would fit most of the ice pops you might buy. But the story doesn't quite end there. I, uh ... acquired an adult version of the ice pop that is essentially a frozen margarita. And the ice pop fit perfectly into the Ice Huggy and did a fine job keeping my hands protected from that evil frozen margarita. So I guess I can use them, even though I don't have kids. The Zeroll ice cream scoop ($14) has been around for a long time - in fact it's celebrating its 75th anniversary. It must be doing something right to be essentially unchanged for all that time. Rather than being a disher-style scoop, this one is a one-piece unit with no moving parts. Well, unless you consider the sloshy stuff in the handle a moving part. The special feature with the Zeroll scoop is that the liquid in the handle is supposed to transfer the heat from your hand to the scoop, which then makes it easier to scoop hard ice cream. And there is definitely heat transfer going on. Leave the scoop in the ice cream container and you'll have a frosty-cold handle and a puddle of melted ice cream around the scoop. But how does it work when it's actually scooping ice cream? Here's the deal. If your freezer temperature is set to "surface of Pluto" and your ice cream is tooth-chippingly hard, this scoop is not going to glide through it like a hot knife through butter. But if your ice cream is just reasonably hard, this scoop will make the job a little easier. You still need to put some effort into harder ice creams - it's a scoop, not a magic wand. Since there aren't any moving parts, this scoop is pretty much indestructible, and the big handle is easy to hang onto. The only downside is that this scoop isn't dishwasher safe. The scoop is aluminum, which doesn't behave well in the dishwasher, and the heat of the dishwasher can make the liquid in the handle expand too much and leak out. But washing it by hand isn't a big deal since it's all smooth surfaces. 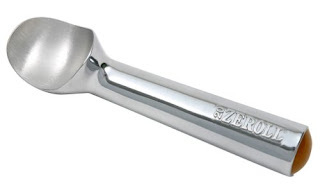 An ice cream scoop isn't an earthshaking gadget, but this one's got a lot going for it. Even if you don't find that the heat-transfer feature makes any difference, it makes a nice-shaped ice cream ball and it's sturdy enough to last nearly forever. 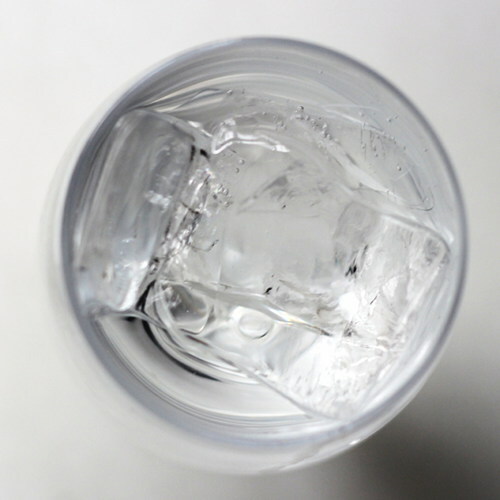 Clear ice is the holy grail of the drink blogger and maybe the beverage geek as well. One answer is to buy ice, but where's the challenge in that? The true ice aficionado wants to make that ice at home from scratch, right? I've heard all kinds of theories on making clear ice. Boiling that water first is supposed to help, but it's not the complete answer. When I got my frigid paws on the Polar Ice Tray ($18.99) I was intrigued. Here's a simple non-mechanical gadget that purports to make clear ice. No voodoo, no batteries, no stirring required. Just a few parts you assemble and put in your freezer. The one I tried was the triangle-shaped tray. The shaping section can be left out to make one giant clear cube, if that's your preference. The idea is that the bright-colored insulating piece forces the ice to freeze from the top down, which forces impurities in the water downward through holes in the bottom of one section and into another section. When you take it all apart, the ice in the top compartment is supposed to be clear while the ice in that second section should be cloudy. Heck yeah. Or, mostly. The first time I tried it, there was a little bit of white ice at the bottom of my pretty clear triangular cubes. Then I thought well, hmmm, if it's all about freezing slowly from the top down, how about starting with warmer water? That did the trick. My triangles of ice were clear and there was cloudy ice in the bottom tray where it belonged. On the plus side, this is a very cool geeky toy. On the downside, it would take you a long time to make enough ice for a party. 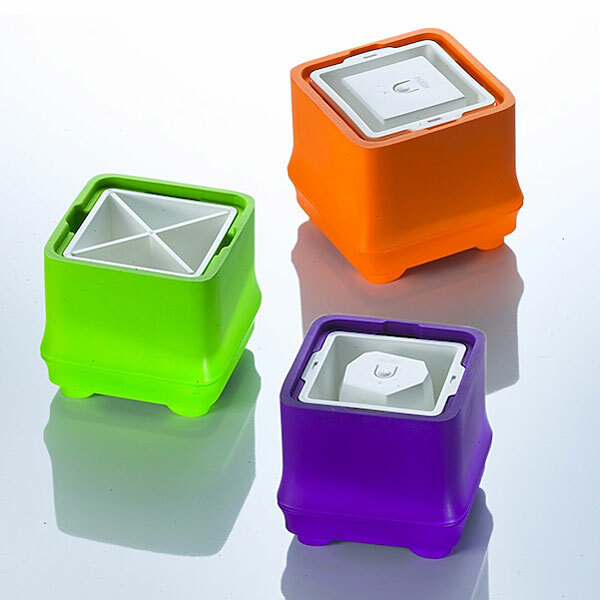 But for a few perfect cubes for a photo or a few drinks, this crazy thing does the trick. That's enough for now, I think. Disclaimer: I was provided with products for the purpose of reviewing these items on Serious Eats. Most people have an idea how to grill a steak or roast a chicken, but when it comes to fancy things that are usually purchased in little jars or come from bowls behind the deli counter, it becomes more mysterious. I'm here to take some of the mystery out of it. And in some cases, the mystery is miniscule. If you have a juicer, tomato jam is incredibly simple, requiring nothing more than a long cooking time, mostly unattended. What's left is much like tomato paste, but with a fresher flavor than what you'll find in cans or tubes. I wouldn't use that paste as a spread, but I'd use this jam. If you don't have a juicer, you've got some added prep time, but it's not difficult. You can use this jam as a spread on sandwiches, or dollop it on pizza. Or, if you must, you can use it like tomato paste in recipes. You might like it so much that you find yourself making it in larger and larger quantities to keep up with the demand. The good news is that it freezes well. If you have a juicer, run the tomatoes through the juicer to separate the juice and flesh from the skin and seeds. If the rejected skin and seed pulp seems wet, run it though the juicer again to extract as much as possible. If you don't have a juicer, you still need to remove the seeds and skin. You can blanch the tomatoes and peel them and seed them. Or quarter them, cook them until soft, and run them though a food mill or strainer. When you've got that done (see, wasn't it easier in a juicer?) put the liquid in non-reactive pan with a heavy bottom, add the salt, and simmer, stirring occasionally to keep it from burning. This process will move along faster in a wide, shallow pan that encourages evaporation, but a saucepan works, too. As the mixture gets thicker, you'll want to stir more often. Lower the heat, if it seems to be sticking to the bottom of the pan. Continue cooking until the jam is thick and it sounds like it's frying rather than bubbling. You should have about 1/2 cup of the jam. Taste for seasoning and add more salt, if needed. This isn't a sweet jam, but if it seems too tart you can add a bit of honey or sugar. Chill until needed. Leeks aren't just big fat onion stalks - they have a taste of their own. This jam included both leeks and onions for both flavor and texture. What can you do with this jam? It's great on sandwiches, either warm or room temperature, and it makes a nice accent on a cheese-topped cracker. I particularly like it with soft cheeses like chevre or cream cheese. Speaking of cream cheese, you could also combine this with cream cheese, thin it with a little milk, and use it as a chip dip or thin it more, add a few herbs, and use it for a salad dressing. I'm sure you can think of plenty of other uses. I started this off in the crock pot, but you can certainly do all the cooking on the stove. Slice the leeks in half lengthwise and cut the white parts and tender green parts into half-moons. Rinse them several times in water - leeks are notoriously dirty. Drain them (they don't need to be dry, but you don't need the extra water) and place them in your slow cooker. Dice the onion and add that to the slow cooker. Add the butter and salt, and cook on low for 8-10 hours. After cooking time is up, the leeks and onions should be very tender. Transfer them, and all the juices, to a pan on the stove. Cook, stirring as needed, until all the liquid has evaporated and the vegetables begin to brown just a little bit. Use immediately or transfer to a container and store in the refrigerator until needed. These are best served slightly warm, hot, or just barely at room temperature. When they are fully chilled, the butter hardens and it's not the best texture. Growing up, I was the kid who loved liver in all forms - liver and onions, liverwurst, and chicken livers were all okay with me. Later, I learned about pate. My mother insisted that hand-chopped chicken livers were the best, but on occasion she'd resort to using a blender or food processor to puree the livers, resulting in a smooth consistency that can't be achieved by hand. You can make these either way, but I suggest you try hand-chopping at least once. Not only is there more texture, but the spread seems lighter and fluffier. This is best served on a cracker, small rounds or squares of toasted bread, or on cocktail rye. We like to garnish it with some chopped raw onion. Melt the butter in a frying pan. Add the livers, onion, salt, and sage. Cook until the onions are softened and the liver is cooked through. Its perfectly fine if you break up the livers as they cook - there's no need to keep them whole. Transfer the cooked liver and onion to a cutting board and chop the heck out of it with a large knife. It should be somewhat smooth, but still with some small bits. You can do this in batches, if it's easier. And you do want to do this while the livers are still warm. If you chill them first, it won't be as easy to chop them and get the right consistency. Chop the eggs finely and add them to the livers. Stir to combine, taste for seasoning, and add salt, if desired. Refrigerate until fully chilled. Before serving, taste the livers again and add more salt, if necessary. If the mixture seems too stiff and tastes dry, you can add a bit of clarified butter or oil, or even some chicken broth, to get it to the right consistency. Stir well and serve chilled or at room temperature. The nice folks at Exclusiv Vodka sent me a bottle of their orange vodka, so of course I had to make a cocktail. It's been a while since I've published a cocktail recipe, right? This is a good transitional cocktail as far as seasonality. It's fruity, which is nice for summer, but it doesn't rely on summer fruits, so you can make it any old time. The Exclusiv Orange Vodka has orange flavor, but it's not overwhelming - this is a flavored vodka and not an orange extract. I'm thinking it might be interesting for cooking - maybe a splash to deglaze a pan - but that's for another post. Right now now, it's cocktail time. I knew I wanted another fruit flavor to go with the orange, and I was thinking about citrus juices, but at the last minute I decided that pineapple juice made a lot more sense. Citrus on top of citrus seemed sort of monotonous. Pineapple pairs well with citrus, but it brings its own flavor along for the ride. And I like pineapple. Since pineapple juice is pretty strongly flavored, I added ginger ale to help balance the flavor, and to add the fizz. Since all my components were cold, I didn't add ice, but you could certainly serve this over a big glass of ice. A wedge of lime would be a nice garnish. The combination of pineapple and orange and ginger ale is fruity, but not too sweet. Refreshing. Lively. Bubbly. Give it a try. Combine all the ingredients and serve in a pretty glass, or if you prefer, serve over ice. A slice of lime would be a nice garnish, and a teeny bit of salt on the rim of the glass would also be appropriate. Disclaimer: I received the orange vodka that I used for this cocktail at no charge. I was never a big fan of banana splits, probably because they were all about quantity and not about quality. The bananas were never ripe enough, the ice cream was always cheap stuff, and I'm not crazy about bananas drizzled with the traditional chocolate sauce. The first thing I did here was make a crazy rich and flavorful ice cream. With something this rich, a little goes a long way. And the bananas were fully ripe and sliced into rounds instead of lengthwise. Much easier to eat that way. I made the ice cream in a half-pint ice cream maker. Because of alcohol in the ice cream, it didn't set up very hard in the ice cream maker. It needed time in the freezer to harden a bit, but it still stayed nice and soft. This ice cream might be a little strong to eat on its own because of the whiskey, but it worked well with the bananas - and no sauce needed. And because it packs such a punch of flavor, a little bit of ice cream was all I needed to go with one whole banana. While I'm not fond of regular chocolate sauce with bananas, the white chocolate garnish was just right. Slice the bananas, and arrange them in a bowl with a scoop of the ice cream in the center. For the garnish, shave white chocolate with a vegetable peeler. What's better than flaky, buttery biscuits? How about flaky, buttery biscuits studded with dried blueberries? There's a little extra sugar in these biscuits, but most of the sweetness comes from the berries. You could use pretty much any dried fruit you like in this - cranberries, chopped apricots, cherries ... whatever you like. There are a lot of different methods for shaping biscuits, from drop biscuits that aren't shaped at all, to gentle patting and prodding to rolling them with a rolling pin. These use the rolling pin method. I like this method for biscuits that have large pieces of butter. Buy rolling the dough, the butter flattens out, just like in pie crust, and the folding creates flaky layers. For a cream biscuit, I'd be much more gentle. Line a baking sheet with parchment paper and preheat your oven to 425 degrees with a rack in the center of the oven. In a large bowl, combine the sugar and flour. Cut the butter into several pieces and add it to the bowl. Using a pastry cutter or two knives cut the butter into the flour until the largest pieces are no larger than a pea. Add the blueberries and stir to combine, then dump in the milk. Stir just enough to moisten all the flour. If the dough is a little wet, don't worry about it. If it seems dense and dry, add a bit more liquid. Flour your work surface and turn out the dough. Shape it into a rough rectangle. Flour the top and roll to a rectangle about 1/4 inch thick. Fold in thirds like a letter. Flour the work surface and dough as needed and roll again, this time to 1/2 inch thick. Fold in thirds again. This time roll to 3/4 inch thick. Using a 2 1/2-inch biscuit cutter, cut as many rounds from the dough as you can, cutting straight down without twisting the cutter. Place them on the prepared baking sheet. Gather the scraps, trying not to turn any of the pieces sideways (this keeps the layers running horizontally) and flatten to the same 3/4-inch thickness. Cut as many pieces as possible again. Gather the scraps again. Usually I make the last biscuit or two free-form. They're not as pretty, but that's fine for sampling. Brush the tops of the biscuits with a little bit of milk and sprinkle with sugar. Bake at 425 degrees in the center of the oven until the biscuits are light golden brown, about 15 minutes. Remove the biscuits from the oven and place on a rack to cook just for a moment before serving. Does the Actifry really work?